Arrowsmith, Nancy, and Moorse, George. A Field Guide to the Little People (Wallaby, 1977). A good starting point for the faerie lore of Europe, this book also has a very useful bibliography. Barrie, J.M. Peter Pan: The Complete and Unabridged Text (Viking, 1991). Bord, Janet. Fairies: Real Encounters With Little People (Carroll & Graf, 1997). A study of the phenomenon of faerie encounters from the Middle Ages to the present. Bourke, Angela. The Burning of Bridget Cleary: A True Story (Penguin USA, 2001). A young wife dies in 1895 from her husband's attempts to counter supposed faerie bewitchment. Bradley, Marion Zimmer. Darkover Landfall (Putnam, 1972). A colony ship from Earth lands on a planet that is home to a reclusive, faerie-like race. The other books in the series cover the hybrid society that develops through interbreeding of the two races. Briggs, Katharine. The Fairies in Tradition and Literature (Routledge & Kegan Paul, 1967). Briggs, Katharine. A Dictionary of Fairies (Penguin, 1977). A comprehensive reference work on the faerie lore of the British Isles. Briggs, Katharine. The Vanishing People: A Study of Traditional Fairy Beliefs (B.T. Batsford, 1978). Briggs, Katharine. British Folk-Tales and Legends: A Sampler (Routledge & Kegan Paul, 1977). Brooks, J.A., ed. Cornish Ghosts and Legends (Jarrold & Sons, 1981). Bull, Emma. War for the Oaks (Tor, 2001). Bunson, Matthew. The Vampire Encyclopedia (Crown Trade Paperbacks, 1993). Includes coverage of fey vampires from several cultures. Campbell, Joseph. The Hero With a Thousand Faces (MJF Books, N.D.). A study of the archetypal Hero's Journey that underlies much folklore and mythology. Carroll, Lewis. The Annotated Alice (W.W. Norton, 1999). Includes Alice in Wonderland and Through the Looking-Glass, with notes explaining some of the inside jokes and Victorian cultural references in these subversive fairytales. Cherryh, C.J. Rusalka (Ballantine, 1990). A fantasy novel drawn from Russian faerie lore. Coleman, Loren and Clark, Jerome. Cryptozoology A-Z (Fireside, 1999). Colton, Harold S. Hopi Kachina Dolls (University of New Mexico Press, 1959). Cooper, Joe. The Case of the Cottingley Fairies (Robert Hale, 1990). Dubois, Pierre. The Great Encyclopedia of Fairies (Simon & Schuster, 2000). Eason, Cassandra. A Complete Guide to Faeries and Magical Beings (Weiser, 2002). Evans-Wentz, Walter Y. Fairy-Faith in Celtic Countries (Citadel 1990). Feist, Raymond E. Faerie Tale (Bantam 1989). European-style faeries plague a family in upstate New York in this uneven horror novel. Fitzpatrick, Jim. The Book of Conquests (Dutton, 1978). An art book that retells the Irish origin-myths, including the tales of the Tuatha De Danaan, using a blend of traditional Irish art styles and comic-book illustration. No academic translation of the original Irish text (also known as the Book of Invasions) is in print at the time of writing. Franz, Marie-Louise von. Animus and Anima in Fairy Tales (Inner City Books, 2002). Jungian psychology applied to fairytales and faerie lore. Frazer, Sir James George. The Golden Bough (Touchstone, 1996; various other editions exist). Originally published in 1890, this is one of the classics of mythological and folklore studies. Gaiman, Neil. Neverwhere (Avon, 1998). Beneath London lies a strange world that is reminiscent in many ways of the faerie realms. Gaiman, Neil. Stardust (Harper Perennial, 2006). Hilarity ensues as a youth ventures into faerie to fetch a falling star in order to impress the prettiest girl in the village – and gets more than he bargained for. Gantz, Jeffrey, trans. The Mabinogion (Penguin Classics, 1976). Gantz, Jeffrey, trans. Early Irish Myths and Sagas (Penguin Classics, 1981). Green, Miranda. The Gods of the Celts (Sutton, 1997). One of several works by this author on Celtic and Romano-Celtic religion. Local folk-deities and spirits of place are one possible ancestry for the faeries of north-west Europe. Guiley, Rosemary Ellen. Encyclopedia of Mystical and Paranormal Experience (Harper Collins, 1991). Haining, Peter. Ancient Mysteries (Sidgwick & Jackson, 1977). Covers several paranormal topics, including evidence for diminutive races in Europe and America. Howey, M. Oldfield. The Cat in Magic, Mythology and Religion (Bracken Books, 1989). Ibsen, Henrik. Peer Gynt (University of Minnesota Press, 1980). The hero's visit to the Hall of the Mountain King retains many characteristics of the folklore visit to the faerie realms, wrapped up in 19th-century Norwegian political satire that has not dated too well. Jackson, Kenneth Hurlstone, trans. A Celtic Miscellany (Penguin Classics, 1976). James I of England, VI of Scotland. Daemonologie (Bodley Head, 1924). While it mainly concerns witches, this book touches upon other areas of the supernatural as seen from the early 17th century. Jonson, Ben. The Alchemist (Ernest Benn, 1966). Faerie gold is one of several scams in the arsenal of a trio of 17th-century con artists. Jordan, Katharine. The Folklore of Ancient Wiltshire (Wiltshire County Council Library & Museum Service, 1990). Keightley, Thomas. The World Guide to Gnomes, Fairies, Elves & Other Little People (Random House, 2000). Kvideland, Reimund, and Sehnsdorf, Henning K., eds. Scandinavian Folk Belief and Legend (University of Minnesota Press, 1988). Larkin, David, ed. Faeries (Harry N. Abrams, 1978). Illustrated by Brian Froud with contributions from Alan Lee, this coffee-table book almost single-handedly established the contemporary popular view of faeries, spawning a number of sequels, imitators and parodies. Lovelock, James. Ages of Gaia: A Biography of Our Living Earth (W.W. Norton & Company, 1988). The seminal work of the Gaia Hypothesis, which suggests that the Earth is a self-regulating entity which can be regarded as alive. Some theorists see faeries as a traditional personification of Gaia, or her actual agents. MacDonald, George. The Complete Fairy Tales (Penguin, 1999). MacDonald was a major force behind the Victorian view of faeries, and an acknowledged influence on later writers, including C.S. Lewis. McLeish, Kenneth. Myth: Myths and Legends of the World Explained (Facts on File, 1996). Matarasso, P.M., trans. The Quest of the Holy Grail (Penguin Classics, 1969). Not strictly a work on faerie, but it is a prominent example of the romantic-chivalric literature that inspired the tone of Spenser's Faerie Queene (q.v.). Mee, Arthur, ed. The Children's Encyclopedia (10 vols. The Educational Book Company, Ltd., N.D.). Includes snippets of British faerie lore as seen from the early part of the 20th century. Murray, Earl. Ghosts of the Old West (Contemporary Books, 1988). Includes accounts of the little people of the Crow Indians, and la Llorona. Niven, Larry. The Magic Goes Away (Ace Books, 1979). A thought-provoking look at what happens when a world runs out of mana. Norman, Howard, ed. Northern Tales: Traditional Stories of Eskimo and Indian Peoples (Pantheon Books, 1990). Opie, Iona and Tatem, Moira, eds. A Dictionary of Superstitions (Oxford University Press, 1992). Ovid. Metamorphoses. A collection of classical mythology by the great Roman poet, this is a good source on classical nymphs and similar beings. Recommended reading for a crossover campaign with GURPS Greece and/or GURPS Imperial Rome, or a campaign set in Mediterranean Europe during other periods. There are multiple editions of this book. Owens, Lily, ed. The Complete Hans Christian Anderson Fairy Tales (Gramercy, 1993). Pelton, Mary Helen, and Di Gennaro, Jacqueline. Images of a People: Tlingit Myths and Legends (Libraries Unlimited, 1992). Philip, Neal, trans. The Complete Fairy Tales of Charles Perrault (Clarion Books, 1993). Purkiss, Diane. At the Bottom of the Garden: A Dark History of Fairies, Hobgoblins, and Other Troublesome Things (New York University Press, 2000). An excellent survey of folk beliefs from classical times to the present day. Radice, Betty. Who's Who in the Ancient World (Penguin, 1973). Rose, Carol. Spirits, Fairies, Leprechauns, and Goblins: an Encyclopedia (W.W. Norton & Company, 1998). Ramos, Maximo D. Creatures of Philippine Lower Mythology (University of the Philippines Press, 1971). Read, Kay Almere, and Gonzalez, Jason J. Handbook of Mesoamerican Mythology (ABC-Clio, 2000). Scott, Michael. Irish Folk and Fairy Tales Omnibus (Sphere, 1983). Seth, Ronald. In the Name of the Devil (Walker, 1969). Includes an account of the trial and confession of Isobel Gowdie, an accused witch who admitted to consorting with faeries in 1662. Shakespeare, William. A Midsummer Night's Dream (Dover, 1992). Various editions are available of Shakespeare's most famous faerie play. Sherman, Jorey. Bamboo Demons (Pinnacle, 1979). A contemporary horror novel drawing upon the Indonesian tradition of the penanggalan. Simpson, Jacqueline. Scandinavian Folktales (Penguin, 1988). Smith, Clark Ashton. A Rendezvous in Averoigne (Arkham House, 1988). A correspondent of H.P. Lovecraft, Smith created many fantastic worlds, including Averoigne, a dark version of the France of chivalric romances and tales of high faerie. Spenser, Edmund. The Faerie Queene (Penguin Classics, 1988). One of several editions of the epic poem that are currently available. Dismissed by some as an extended work of flattery aimed at Elizabeth I, it is nonetheless a turning point in the treatment of faeries by literature. Wales, Gerald of (a.k.a. Giraldus Cambrensis). The Journey Through Wales and The Description of Wales (Penguin Classics, 1978). A 12th-century churchman describes various places and happenings in Wales, including supernatural and faerie encounters. Wales, Gerald of (a.k.a. Giraldus Cambrensis). The History and Topography of Ireland (Penguin Classics, 1982). An account of Ireland in the 12th century, including may anecdotes of miraculous and supernatural occurrences. Waters, Frank. Book of the Hopi (Penguin, 1977). Tells about the kachinas and other elements of Hopi tradition. Watkins, Alfred. The Old Straight Track (Methuen, 1925). The ley line theory rekindled interest in the paranormal properties of prehistoric monuments in the British Isles and elsewhere. Yeats, W.B., ed. Fairy and Folk Tales of the Irish Peasantry (Dover, 1992). A republication of the original 1888 edition by the famous Irish poet. Celtic faeries hold their own in the Victorian era. Zipes, Jack, ed. Victorian Fairy Tales: The Revolt of the Fairies and the Elves (Routledge Kegan & Paul, 1989). A collection of tales from English writers including Charles Dickens, Lewis Carroll, Oscar Wilde, Edith Nesbitt, and Rudyard Kipling. Zipes, Jack, trans. The Complete Fairy Tales of the Brothers Grimm (Bantam Books, 1992). Zipes, Jack, ed. The Oxford Companion to Fairy Tales (Oxford University Press, 2000). A comprehensive reference for writers and editors, but disappointingly light on actual faerie lore. Zipes, Jack. Breaking the Magic Spell: Radical Theories of Folk and Fairy Tales (University Press of Kentucky, 2002). Blair, Jason L. Little Fears (Key 20, 2001). It's tough to be a child when closet monsters are real, malevolent entities just waiting for the light to go out. A good treatment of childhood fears and imagination in a roleplaying game; useful inspiration for GMs planning a faerie campaign with one or more children as PCs. Carella, C.J. GURPS Imperial Rome (Steve Jackson Games, 2000). The mythology that Rome inherited from Greece included traditions of faerie-like nymphs and forest people. The lares and penates, to whom shrines were maintained in every house, can be interpreted as domestic faeries or as patron spirits of the family. Carella, C.J. GURPS Voodoo: The Shadow War (Steve Jackson Games, 1995). Faeries can be seen as one or more types of In-Betweener, and likely be active in the Shadow War at some level. Dale, Malcolm and Thomas, Klaude. GURPS Goblins (Steve Jackson Games, 1996). A setting heavily influenced by faerie lore, but with little magic. Faeries are not out of place here, but it is doubtful that they would be welcome, either. Davis, Graeme. GURPS Middle Ages 1 (Steve Jackson Games, 2002). Includes information on romantic-chivalric settings, which influenced later faerie literature. Davis, Graeme. GURPS Vikings (Steve Jackson Games, 2002). Includes information on various Scandinavian faerie types. Gold, Lee and Johnson, Hunter. GURPS Japan (Steve Jackson Games, 2003). 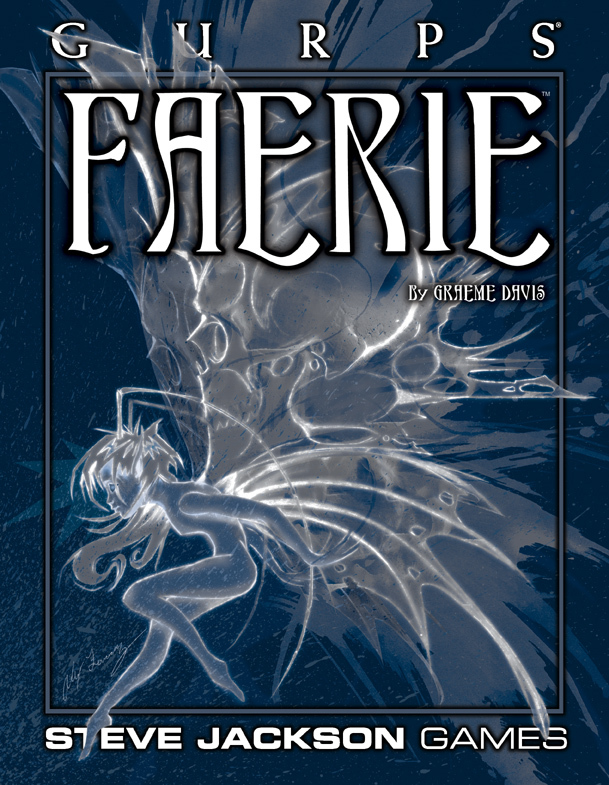 Includes information on kami, bakemono, and other faerie-like creatures. Hite, Kenneth. GURPS Cabal (Steve Jackson Games, 2001). A horror setting that can easily include faeries. Jackson, Steve. GURPS Magic (Steve Jackson Games, 2000). While it is possible to run a faerie campaign using just this book, the Basic Set and GURPS Compendium I, this book allows the GM to make faeries more interesting, and model folklore more closely. Kenson, Stephen. GURPS Spirits (Steve Jackson Games, 2001). Includes a treatment of faeries as spirits. Lemke, Ian et al. Changeling: The Dreaming (White Wolf, 1997). 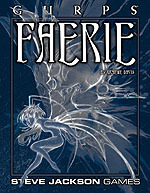 The rulebook and its supplements cover faeries in White Wolf's World of Darkness game setting. It has a lighter tone than the other World of Darkness games, but does not neglect the underlying horror. A good source of inspiration for modern/postmodern and feypunk campaigns. Masters, Phil. GURPS Arabian Nights (Steve Jackson Games, 2000). Includes information on djinn. Masters, Phil, and Cambias, James L. GURPS Castle Falkenstein (Steve Jackson Games, 2000). Romanticized noble faeries are one of several supernatural races in this magical analog of early 19th-century Europe. Naylor, Janet and Julian, Caroline. GURPS Religion (Steve Jackson Games, 1999). Useful for a Faerie campaign where religion and clerical magic will play a major role. Pratchett, Terry and Masters, Phil. Discworld Roleplaying Game (Steve Jackson Games, 1999) and Discworld Also (Steve Jackson Games, 2001). Both books include comic versions of elves, pixies, and other faerie-like races. Ross, S. John. GURPS Russia (Steve Jackson Games, 2000). Includes information on domovye, rusalka, and other faerie-like creatures. Tynes, John. Puppetland (Hogshead Publishing, 1999). Although puppets are not quite the same as faeries, the mixture of childlike innocence and visceral horror in this game setting are quite applicable to a faerie campaign. Walton, Ken and Jo. GURPS Celtic Myth (Steve Jackson Games, 1998). Welsh and Irish legends were one of the major sources for faerie lore. A campaign in this setting, more than almost any other, shows faeries in their natural environment. Includes information on the Sidhe and other Celtic faerie types. Zeigler, Jon F. GURPS Greece (Steve Jackson Games, 1998). The nymphs and satyrs of Greek myth have a great deal in common with faeries, and are thought by some folklorists to be their ancestors. Darby O'Gill and the Little People (Robert Stevenson, 1959). This Walt Disney treatment of leprechauns encapsulates their 20th-century fairytale image. It can be a good basis for a cliché campaign, or subverted for a silly campaign. Fairy Tale: A True Story (Charles Sturridge, 1997). A reworking of the case of the Cottingley faerie photographs into a semi-sweet family drama. Notable for Peter O'Toole as Sir Arthur Conan Doyle, who became an advocate for the photographs' veracity, and Harvey Keitel as Harry Houdini. Harvey (Henry Koster, 1950). James Stewart is haunted by an invisible spirit he names Harvey, who he says is a phouka and describes as a white rabbit six feet tall. Labyrinth (Jim Henson, 1986). Faerie lore takes second place to Muppet wizardry, with David Bowie as a most unlikely goblin king. Legend (Ridley Scott, 1986). An uneven attempt to reuse some of the classic elements of faerie lore. Annabelle Lanyon, as the faerie Oona, gives a convincing interpretation of the capriciousness and amorality sometimes attributed to faeries. Leprechaun (Mark Jones, 1993). This movie and its uneven sequels perpetuate the popular image of the leprechaun, which is somewhat at odds with folklore. However, there are some interesting folklore elements, such as the magically enhanced maze-like quality of the creature's lair in the second movie. Midsummer Night's Dream, A (Peter Hall, 1969). A trippy, arty, sometimes confusing version of the Shakespeare play by a director famed for his avant-garde stage productions. Midsummer Night's Dream, A (Michael Hoffman, 1999). An ensemble cast including Michelle Pfeiffer, Kevin Kline, Rupert Everett, and Helena Bonham Carter, shot in Tuscany with more than a dash of Merchant-Ivory period drama about the costumes and art direction. Lightweight, but inoffensive. Photographing Fairies (Nick Willing, 1997). A different view of the Cottingley case, featuring a photographer who finds a kind of personal salvation when he becomes convinced that the photographs are genuine. Dark, trippy, and not for children (link is for the PAL DVD). Spaceman and King Arthur, The, aka Unidentified Flying Oddball (Russ Mayberry, 1979). An updating of Mark Twain's A Connecticut Yankee in King Arthur's Court, this Walt Disney movie provides some inspiration for a humorous campaign in which space travelers encounter a faerie-like world. Stardust (Matthew Vaughn, 2007), Michelle Pfeiffer, Robert De Niro, Charlie Cox, and Claire Danes. Based on Neil Gaiman's novel of the same name, and considered by some to be better than the book. Robert De Niro steals the show.